... if you're like me, it'll only take a couple of hair-raising ghostly stories to make you put down your camera for a bit and listen. A goldmine of vertical, horizontal and diagonal lines in the castle and the formal garden in front. "Money doesn't matter. Just build what I want!" And they did! Not just a 40 room, Tudor style mansion, but 565 acres of formal gardens, forest and farm land. There were 100 groundskeepers and gardeners tending to the estate while the Dunsmuir family lived in the mansion (1908 until 1937). Once upon a time, white orchids from India filled the conservatory, exactly the place a gigantic banana tree pushed its way up to the sunshine in the central dome. 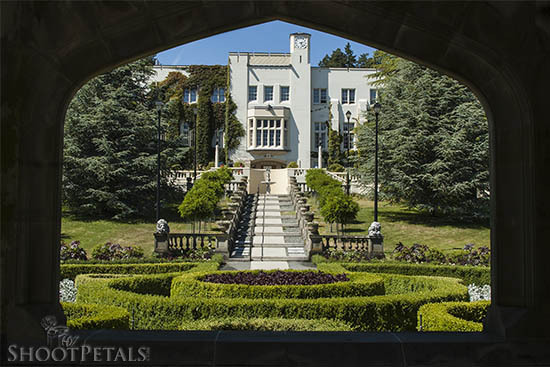 In 1940, the property was purchased by the Canadian Government as a Naval Training Academy. It went through several changes over the years as a military training establishment. Finally, in June 1995, the province of BC leased the land from the Federal Government and transformed the military college into the public Royal Roads University. Also in 1995, it became a National Historic Site, which is why all of us get to enjoy this spectacular property! We're so lucky. The day I shot these photos, it was much too sunny and bright... you take what you can get! I used some photo editing treatments in an attempt to reduce some of the contrast. I'll go back another day with some cloud cover. I'm looking forward to doing it all again! Such a romantic part of the castle gardens... this window in the Italian Garden has the air of Europe. The birds were singing their little hearts out just outside the open window. 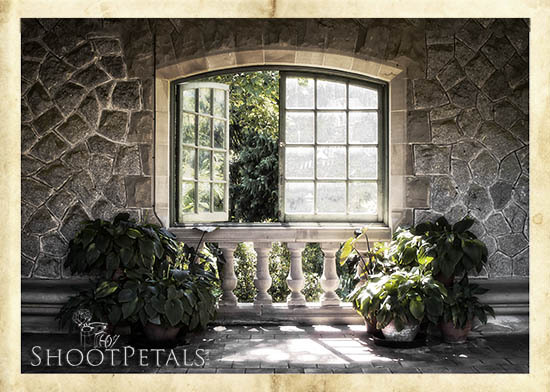 Italian Garden at Hatley Mansion with sun streaming through the window. Such gorgeous texture and patterns everywhere. The stonework in the wall has loads of detail and I can feel the warm sun streaming through the window. A super space for wedding photographs! Caio to the Italian Garden... we're on the move. There are water bodies aplenty here on the property. The lake in the Japanese Garden and a babbling brook or two. Take a circular polarizer so you can cut the glare and reflections on the water if you want. I happen to like photographing reflections but I used my polarizer to cut down on the contrast during mid day. 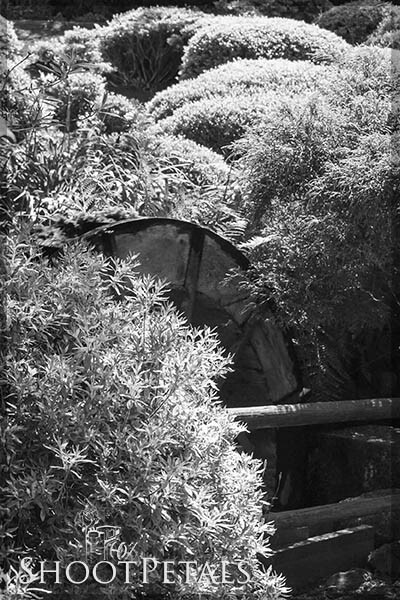 Trimmed bushes and the water wheel in Hatley Castle garden. Sit and listen to the calming water. I turned this scene black and white in Photoshop because it was so high contrast. Without colour, we get back to basics where form and texture dominate. It was not the best day for photography with such harsh shadows, but I loved this water wheel and the gurgling sounds. The best time of day to photograph is early morning or evening when the sun is lower in the sky. Or hope for a slightly overcast day so you get a more even light - less chance of blowing out highlights or shadows. ... drat, he isn't in any of them! Maybe you'll be luckier than I was. 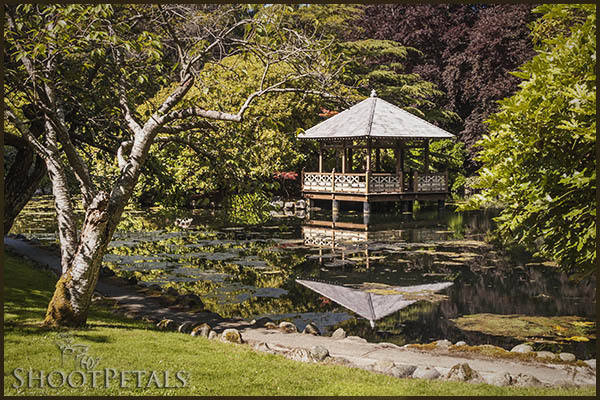 The gazebo in the Japanese Garden pond at Hatley Castle is reflected in the water - edited in On1 with HDR preset. But no sign of young James! The Japanese Garden covers a large area with very different 'sub gardens' and a variety of photo scenarios. Look for wooden bridges... snow and pedestal lanterns and the pavilion on the lake at Hatley Castle. The formal Italian Garden is to the right at the back of the castle. To soften the contrast and add an antique style to the photos, these two images are dipped in a soft pinkish brown tone. The Italian Garden - balcony with hanging plants. So romantic in antique pink, courtesy of Photoshop. I decreased the clarity and didn't apply any sharpening... also decreased contrast so the image looks a teeny washed out and old. 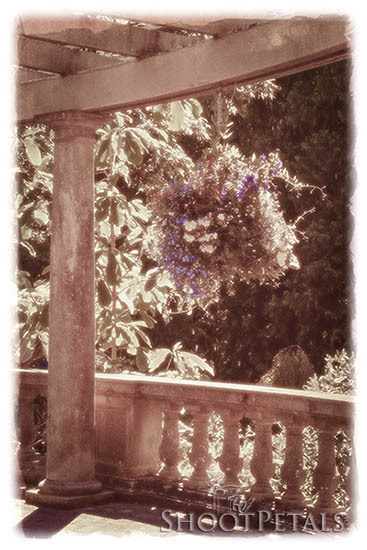 I let a little of the violet colour of the flowers in the hanging baskets peek through... it's all Photoshop magic! The photo of the window in the stone wall towards the top of the page is taken just to the left of this scene. A perfect place to get photos with patterns and textures.... but the entire estate is a photo-rich experience. The framing is obvious. On three sides of the picture, the stone balcony, a pillar and the wood plank roof surround the hanging basket. They all have lots of texture and patterns. Framing your subject is a good way to make your photo more interesting and direct attention to a main subject. The dark trees in the background aren't fussy and detailed - that's good because they highlight the hanging basket. Italian Garden - balcony area with hanging plants. A romantic pink treatment in Photoshop. The structure in these two pictures is a very important part of the story. 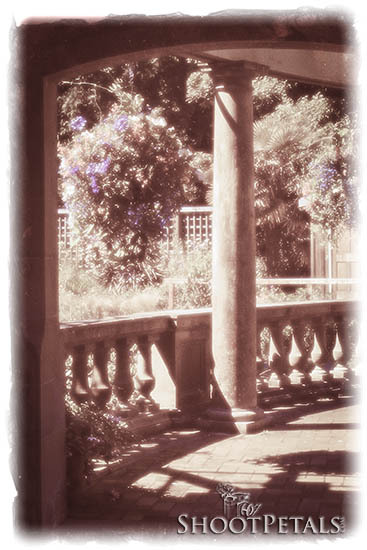 I wanted to let everyone see the environment of this romantic Italian Garden at Hatley Castle. It's not just about the flowers... it's a story about the whole environment and the 'frame' is a co-star in this scene. ... Hollywood Swoons Over It, Too. This is the scene as you walk towards the front of the castle from Royal Roads College. A very formal garden and stone planters skirting both sides of a sloping walkway. It's all just too overwhelming when you have a camera in your hands! If you have time, do a walk-about first and take it all in. Decide what scenes you'd like to shoot, write them down in a notebook, Depending on how much time you have, go back over the areas you want to photograph and concentrate on a few really great images. Textured stonework is everywhere... and endless patterns in the plants and structures. The front entrance and formal garden at Hatley Park has abundant lines, repeating patterns and curves. Just how many TV shows and movies were shot here? Poltergeist: The Legacy... my absolute favorite ever! So, it's not just a serious photography destination... Hollywood's shot more than 33 major movies in the mansion and gardens in the last 75 years. I did get some photos in the Formal Rose Garden but most of the blooms were finished by the time I arrived. They looked pretty darned tired! I think May and June would be absolutely spectacular and I'm going to follow up on that this spring. 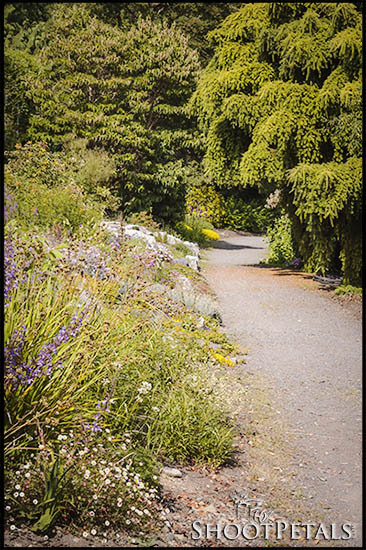 The wildflower path from the Formal Rose Garden. Off to the pond and the Japanese Garden. C'mon! Even the wildflowers are a bit straggly now along this path. I'm leaving the Rose Garden for the Japanese Garden and a few more photos before I leave. Along the way, you'll cross a stream with some photo opportunities. You'll end up at the lake in the Japanese Garden. I'm planning another visit early this spring and I'm hyped about it. And this one's for late this month... May, or early June. That rose garden should be absolutely fabulous! I'll come back here and update you. The front door at Hatley Castle, looking at the College bulding and formal garden. 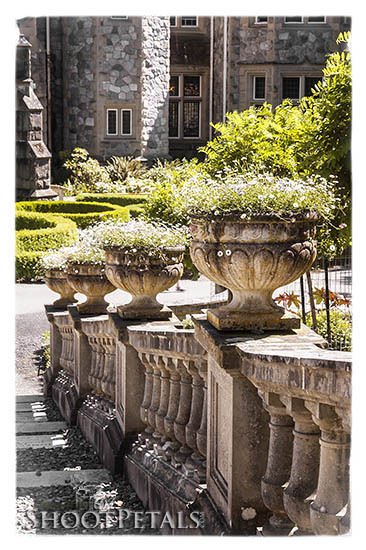 Hatley Castle and gardens has to be close to the top of your travel photography wish list. It's worth a full day for the pictures and an add-on tour of the castle, museum and gift shop. 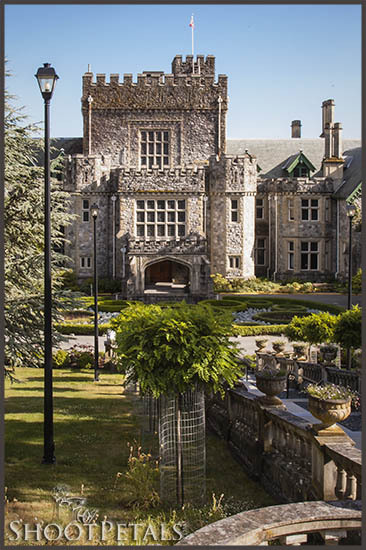 Make your plans by visiting either the Hatley Castle or the Royal Roads College websites. You might want to phone and make sure there isn't a special event, like a wedding, that might put limits on where you can go in the gardens. I've been disappointed a few times in different gardens when there were weddings or they were shooting a movie. Always a good idea to check it out ahead of time. Ciao for now... until after my late spring visit.